The article takes almost the whole page 31. 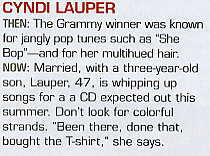 Here is only the part talking about Cyndi. Others pictured are Stevie Nicks, Heart (from Girls with guitars too), the Go-Go’s and the Bangles. THEN: The Grammy winner was known for jangly pop tunes such as “She Bop” – and for her multihued hair. NOW: Married, with a three-year-old son, Lauper, 47, is whipping up songs for a CD expected out this summer. Don’t look for colorful strands. “Been there, done that, bought the T-shirt”, she says. 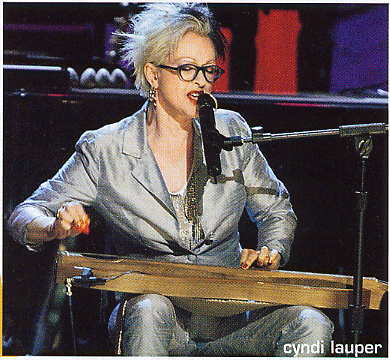 Cyndi Lauper on Lesbians in her Family, Joni Mitchell and Gay PrideCyndi performed on the PFlag float.